Just wanted to share a wonderful story that happened to me this Holiday Season about our wonderful deceased dog Lyndsey and a pigeon. That bird followed me around the entire day. When I needed to go out to my barn, she would fly with me. When I walked inside the house, she pecked on the door until I came out. She was either on my arm or shoulder for the entire afternoon. As I sat on the couch unwinding, she peered through the skylight, and eventually nestled into a warm ball and fell asleep. She greeted me in the mornings with a beautiful coo, and flapped her wings as I backed down the driveway for work. She was with us for eight days, never leaving sight of us. We used one of Lyndsey's favorite old blankets for a nice resting place on our front porch. The pigeon slept there every night until Christmas Eve. Two days later, my father called from Glendale Arizona. 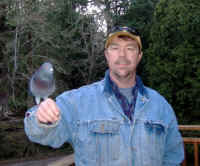 He said, "Ron, you won't believe what flew down our chimney this afternoon, a gray pigeon!" I've never been much on reincarnation, but it's nice to think that my ole' dog Lyndsey, who passed away November 1 after spending 17 years with me, has found a little way to hang around for the Holidays...and to let everyone know that she is well and looking after us. [Ed. Note:] We don't believe in reincarnation, but we do believe that God has some very special ways of comforting us in our times of need. And, God could definitely have sent this pigeon (angel) in the spirit and soul of Lyndsey.